Michael Dunlop’s Senior TT-winning Bennetts Suzuki will take pride of place on the Suzuki stand at this weekend’s Carole Nash MCN London Motorcycle Show, which kicks off at London’s ExCeL. Still splattered in Manx flies from his epic Senior TT win last June, the GSX-R1000 will feature on the Suzuki stand alongside the Japanese marque’s extensive range. Suzuki’s 2018 line-up is headed by the all-new Suzuki SV650X, which takes the same punchy 645cc v-twin motor as the standard SV650 but comes with café-racer-inspired styling and a sportier ride, featuring clip-on handlebars, a tuck-roll seat, headlight cowling and new, pre-load adjustable front forks – all for just £5,999. Suzuki will also feature their GSX-R125, GSX-S125, GSX-S750, GSX-S1000, GSX-S1000F, GSX250R and SV650 on their stand, alongside the more adventure-based models including the V-Strom 1000X GT, V-Strom 650X GT and V-Strom 250 as well as the Burgman 650 and 400 maxi-scooters. As well as Dunlop’s TT-winning GSX-R, the machine Richard Cooper and Bradley Ray will campaign for the Buildbase Suzuki team in the 2018 British Superbike Championship will also be on display with both riders visiting the Suzuki stand at various points across the show. 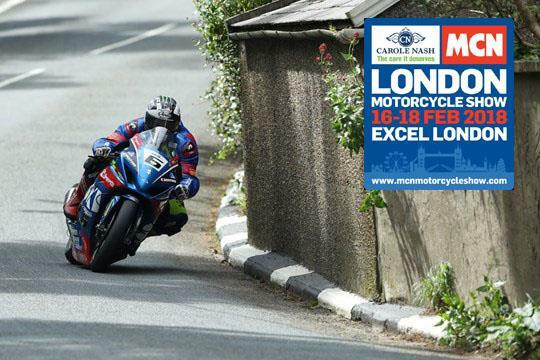 The MCN London motorcycle show takes place from 16-18 February, with doors opening at 10am on Friday 16, and 9am on Saturday 17 and Sunday 18.